With digital accounting for 30 percent of Visa’s global marketing spend, the financial giant’s World Cup media plan kicks into gear today via YouTube, Facebook and Twitter placements. This year’s World Cup is the marketer’s second time sponsoring the tournament as one FIFA’s global official advertisers. Visa CMO Kevin Burke spoke with Adweek about how digital’s role has changed since 2010. 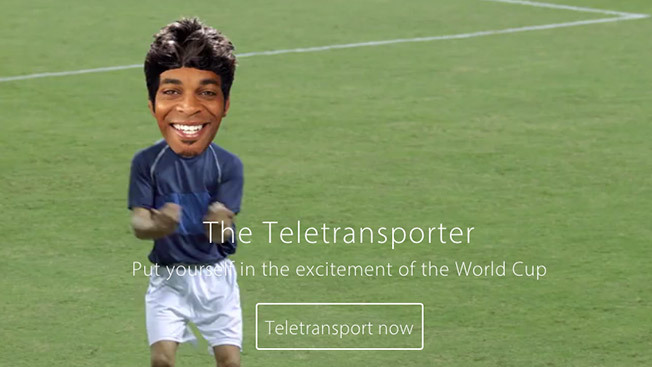 Visa’s putting a unique twist on the selfie craze this year with a new social tool called Teletransporter. Consumers stick a digital photo onto the face of 13 different characters and players from the games, which creates a short video clip that’s sharable across social media. The financial services company has an influencer-like program called "Visa Fanbassador" in place for the games. Eleven people from each of the countries where Visa is activating the World Cup (like Mexico and Japan) will churn out Instagram, Facebook, Vine and Twitter content on behalf of the marketer. Facebook claims that 500 million of its 1.3 billion users are self-identified football fans. Visa is tapping into this group of sports enthusiasts with customized content. "What we’re doing this year that’s a little bit different than what we did in 2010 or even what we’ve done for the Olympics is we’re using those channels to better target based on what consumers have volunteered in terms of their own social graph," Burke said. Visa’s World Cup push has a strong digital video component. One film, called "United in Rivalry," celebrates the unity that the World Cup brings to football fans. Another set of videos—"Samba of the World"—challenged film directors to create 90-second spots with $25,000 depicting how fans in each of the 32 participating countries celebrate the tournament. The video is being pushed out on YouTube, Facebook and Twitter. Similar to its sponsorship of other sports events, mobile continues to play a bigger role for Visa this year, particularly in markets like Korea where ownership of smartphones and tablets is higher than in other areas. "Desktop is still important as are other channels, but mobile’s at the heart," said Burke.